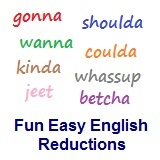 ﻿ Fun Easy English - new-american-english-reductions-reduced-words-topic-what-is-word-what-is-up-whassup. In this lesson you will learn the American English reduction whassup. Whassup with your girlfriend these days? Whassup with these drink prices? Whassup with your lousy attitude? Note: Whassup can also be used as a greeting (same as hi or hello) without actually asking somebody for information (What's new?) every time. Hey I was kinda wondering whassup with all of you. I wanna know what kindsa lessons you want to see in Fun Easy English. Post a comment at the bottom of any Fun Easy English page and lemme know. I really wancha to do this. Your posts will gimme some ideas for new lessons. I am gonna add a lot of new stuff to the Fun Easy English classroom. Reductions, such as whassup are not real words in English.